This is Chris Ford in a state of high excitement, as you can tell from his cheerful posture and jaunty placing of his hands in his pockets. 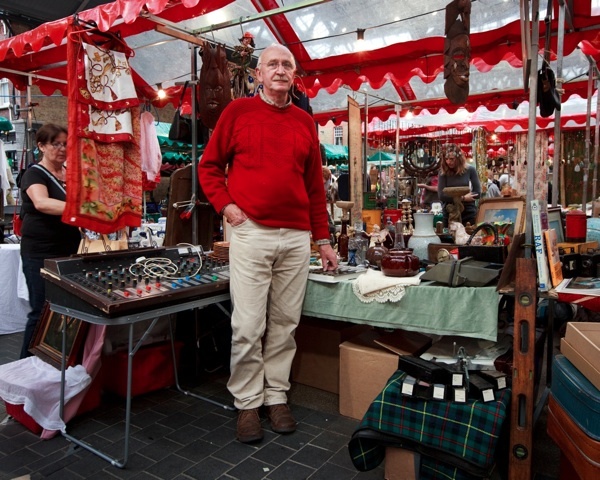 “I used to work in A&E at the Royal London Hospital, but this is much more fun!” he admitted to me breathlessly on his first day as a trader at the market – an escapade that constitutes a “day off” from his chosen profession of nursing. “I think the other dealers smelled fresh blood, they were going through our boxes before we’d even had time to unpack.” he whispered, widening his eyes in thrilled amazement, “So we were able to make big chunk of money at the beginning and everything since has been a bonus.” Coming to the market is an unexpected adventure for Chris.“My partner inherited an entire house full of antiques and we didn’t know what to do with it,” he revealed. Though, in spite of the day’s success, I doubt if he will be forsaking A&E just yet. “Somehow, I don’t think this will bring home the bacon,” Chris replied with a shrug, when I asked if he was considering a career change. 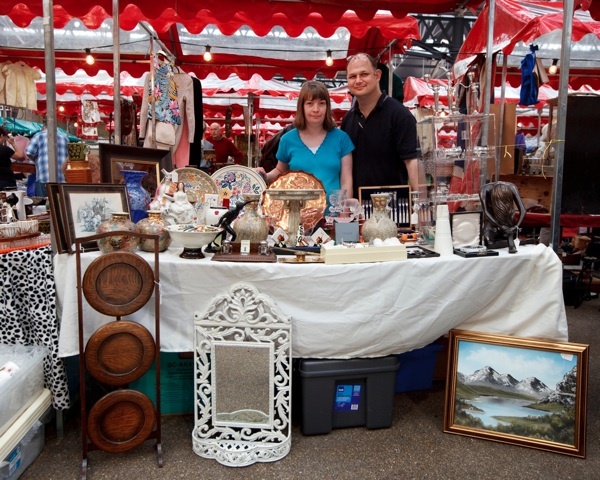 This is Danny Hamilton & Vicky Gibson, also pictured on their first day’s trading, enjoying an auspicious start in the crowded market hall filled with those escaping the Summer downpour. “It’s been really good,” Danny admitted to me, rubbing his hands in satisfaction,“There is a real buzz in here today.” Danny brought a range of things to test the market – from a fine piece of Staffordshire to a nicely painted Poole plate, and a selection of the old silverware that is his personal speciality. “I grew up with antiques because my father used to buy them to furnish the old cottage we lived in,” explained Danny, who started dealing in silver two years ago. 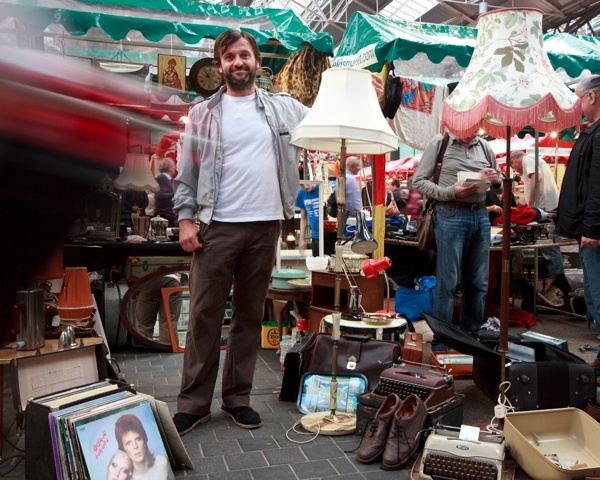 Like many in this market, Danny began as a collector and then started trading. By contrast, “I’m just here to learn what I can,” proposed Vicky modestly. Yet, although she claimed she was only there to offer moral support to Danny, the one item she had on the stall was sold. “I bought it yesterday and sold it today, “ she announced in triumph, “doubled my money!” So I think we may conclude this pair are here to stay. 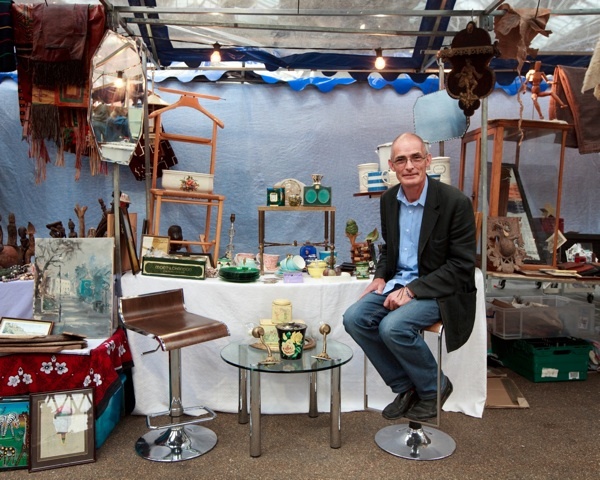 This is the softly spoken and erudite Eugene Tiernan, an antique dealer of thirty-two years experience. “My mother was a dealer in Ireland,” he began, as a conversation opener, whilst I took my perch on the vacant stool beside him.“I have always operated at the decorative end of the market, and I have an encyclopaedic knowledge of the decorative arts of the nineteenth and twentieth centuries,” Eugene told me, as if that was something quite commonplace, adding for interest’s sake “- the style of how we live today was really decided in the early nineteenth century at the time of the Prince Regent.” There is no doubt that Eugene brings a touch of class to the market, though he would blush if you were to compliment him on his educated loquacity. “I don’t stall any place other than Spitalfields Market,” he confided to me, as if he were revealing a priceless secret, “I believe in it because it has an incredible cross-section of people with great knowledge and I know a new look will emerge out of this market.” Now that Eugene has spoken, it is only a matter of time. This dignified gentleman is Robert Russell, who got up at quarter to four in the morning to come here from Kent. “This is a side interest,” Robert admitted to me discreetly, which made his early rising even more impressive. “If I was doing this to make a living, I’d be struggling.” he added, catching my eye and talking plainly from experience, before conjuring a picture of his crowded existence in the country,“Since I retired from British Airways, I’ve got nearly ten acres of ground which keeps me busy. You’d think that if I was retired, I have all the time in the world but it doesn’t work that way. I’m not objecting, I’m happy to be busy and I have plenty of animals – five geese, two rare breed sheep, a cat, and two dogs looking for a walk.” Robert’s day out in the market may constitute a break from his rural menagerie, yet he always comes up with plenty of interesting new finds – like the nineteen seventies manually operated mixing desk and the boxes of magic lantern slides, both examples of equally arcane technology today. 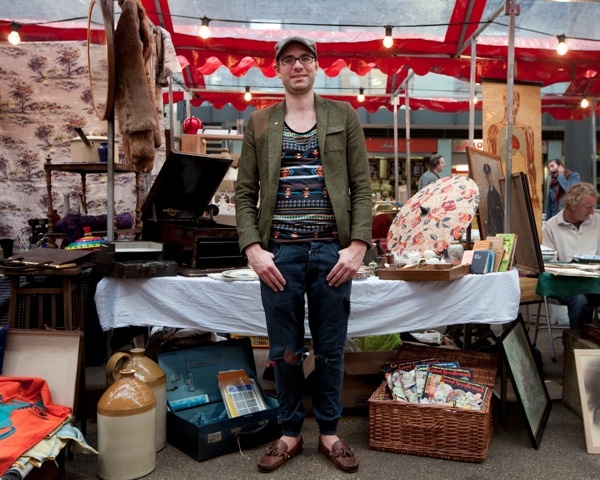 I’ve always been interested in having a stall….how on earth and where on earth do you start? And is it any more…’refined’ than car-boot selling?